I didn't realize how greatly this book had impacted my thinking until I got to college and started leading a small group. 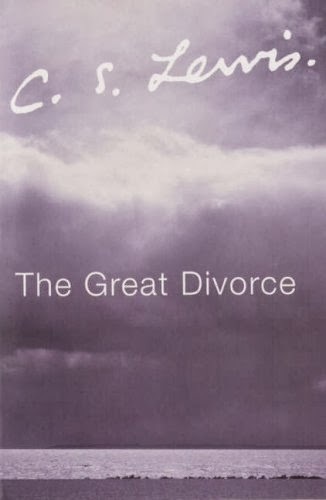 Nearly every time I was walking through issues with someone, the words, "There's this part in The Great Divorce..." would come out of my mouth. There are so many types represented in this book, which makes it an endless applicable tale. 'But of course not!' said the Lady; and her smile made me wonder how both the phantoms could refrain from crying out with joy. 'What needs could I have,' she said, 'now that I have all? I am full now, not empty. I am in Love Himself, not lonely. Strong, not weak. You shall be the same. Come and see. We shall have no need for one another now: we can begin to love truly.' ... 'Listen to reason. Did you think joy was created to live always under that threat? Always defenseless against those who would rather be miserable than have their self-will crossed? For it was real misery. I know that now. You made yourself really wretched. That you can still do. But you can no longer communicate your wretchedness. Everything becomes more and more itself. Here is joy that cannot be shaken. Our light can swallow up your darkness; but your darkness cannot now infect our life. No, no, no. Come to us. We will not go to you. Can you really have thought that love and joy would always be at the mercy of frowns and sighs? Did you not know they were stronger than their opposites?" ...'You do not love me,' said the Tragedian in a thin bat-like voice: and he was now very difficult to see. Whew. I just love that. I know that allegories aren't everyone's bag, but when they are well-executed, I love me a good allegory. This is a great one.